UDM Downloads > iPod Video Converter Suite! iPod Video Converter Suite is an all-in-one iPod video Conversion solution. This suit includes " iPod Movie Video Converter" and "DVD to iPod Converter"(DVD Ripper Include). 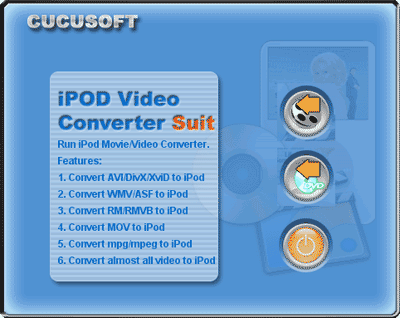 So with this iPod Video Converter suite, you can convert both DVD media and video file media to iPod video/iPod movie. You can enjoy your favorite DVD and video clip on your iPod as a portable DVD Player. Now you can get this DVD to iPod Converter at a very competitive price! We support convert DVD to iPod directly. Some other softwares need two steps: 1. convert DVD to avi; 2. convert output avi to iPod. That solution wastes lots of your time. We need only one step, direct convert video DVD to iPod. So our conversion speed is far faster than others. Features of iPod Video Converter + DVD to iPod Suite : 1. Direct convert DVD to iPod. (Some other software will convert DVD to avi, then convert avi to iPod, that waste lots of time. We only need one step, direct convert DVD to iPod.) 2. Support almost all kinds of DVD to iPod Movie / iPod Video format (MP4 format) 3. Support almost all video file including DVD, vob, DivX, XviD, MOV, rm, rmvb, MPEG, WMV, AVI to iPod video (MP4 format) 4. Support various iPod video size including H.264 video: up to 768 Kbps, 320 x 240, 30 frames per sec., Baseline Profile up to Level 1.3 with AAC-LC up to 160 Kbps, 48 Khz, stereo audio in .m4v, .mp4 and .mov file formats; MPEG-4 video: up to 2.5 mbps, 480 x 480, 30 frames per sec., Simple Profile with AAC-LC up to 160 Kbps, 48 Khz, stereo audio in .m4v, .mp4 and .mov file formats 5. Support "Drag and Drop" 6. Support for Subtitle Selection, eg. English Subtitle, French Subtitle ...... 7. Support for Audio Track Selection, eg. English audio track, French audio track..... 8. Various kinds of video crop mode. eg. 16:9, 4:3, full screen and so on. 9. Support DVD to VCD/SVCD conversion.